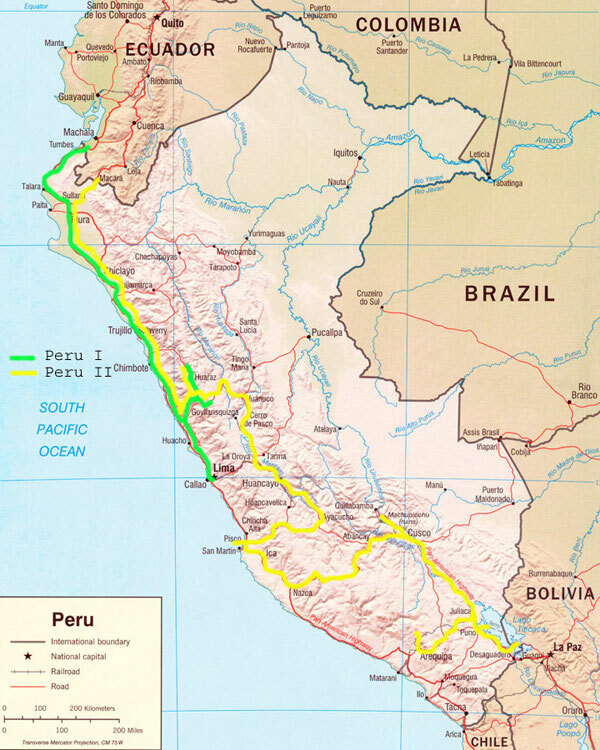 261 km of cycling - as part of a bicycle world trip - from the capital Lima via the Panamerican Highway northwards along the coast, ascending the Andes to Cordillera Huayhuash, to Huaraz in the Cordillera Blanca. There altitude acclimatisation with glacier climb training and trekking, successfully climbing 6,034 m Tocllaraju, then by bus to Ecuador. Do you like Cycling Peru I? 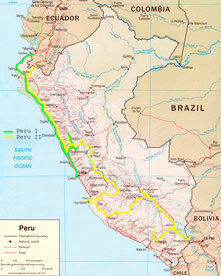 Having spent a few foggy days in Lima I started north on the Panamericana before heading into the Andes. And with that day travelling itself became far more extreme. Cycling uphill for just 100 km from 0 to more than 4,100 m above sea level really took my breath away! Luckily I got the chance to experience the welcoming Peruvian hospitality, as halfway up the Andes I got invited to stay in a private house, a simple but well-maintained house right beside the road. Climbing 4,217 m I crossed the pass to Cordillera Huayhuash where I stayed in Chiquian at 3,400 m above sea level. There a mixture of altitude sickness, flu and serious stomach problems because of an obscure but cheap mighty cheese, forced me to stay in bed for a few days. So I got time to watch German soccer all the way to its end in the semifinal of the FIFA World Cup 2006 in my home country. A couple of days later I felt much better and got started, heading for Huaraz, where I became aware of another serious health problem: a conjunctivitis at both eyes. But anyway I had to wait a few days for Vladimir from Israel. We had met at Easter Island a couple of weeks ago. When he arrived we started with some serious ice climbing at Pastoruri Glacier at an altitude of 5,000 m, which was, little astonishing, quite exhausting! But we felt ready for some decent climbing. Though - for proper acclimatisation - we first did a five-day trek with two mules and the mule driver José through Santa Cruz Valley. Again I got attacked by woh-knows-what-kind-of-disease with fever, so climbing the highest point at 4,750 m became far more breathtaking than expected. Eventually, I felt better, so three days later we started the real thing: climbing 6,034 m Tocllaraju! On the first day we walked eastwards in Cordillera Blanca to Tocllaraju basecamp at 4,350 m. The next day we started, in the end more climbing than walking, with incredibly heavy backpacks, the way uphill to camp 1 at 5,100 m. At 1:00 am in the middle of the night we started climbing for the summit. It´s hard to imagine what it´s like to get up in the middle of the night at more than 5,000 m above sea level (Europe´s highest peak has "just" 4,800 m!) and start climbing over glaciers and through vertical icewalls in the dark! Each single step seems to be the last possible one before getting knocked out by the thin air. After eight hours of endless snow and ice and countless partly vertical walls we finally reached the last wall right underneath the summit! I guess, in the end we only made it because the summit was that close. However, we made it! There we were, at the summit of Tocllaraju at 6,034 m above sea level! A couple of heroic pictures, then we started heading back the long and not less exhausting way to camp 1. After Abseiling the icewalls and endless steeply downhill walking we finally got back to camp 1 where we picked up all our stuff and started climbing and walking all the way down to the basecamp. It was nearly getting dark as we finally reached it with the virtually last steps we were able to make. Having spent more than 19 hours of climbing and walking in extreme altitude we only had one beer and fell asleep immediately! But we had made it! And we had been the only team that day, that made it all the way to the summit! The next day we walked back to Huaraz-Valley, proud and perfectly happy. Two days later it was time to say goodbye to Vladimir who was heading south and then back to Israel. I had to pick up a parcel in Ecuador, so I packed my backpack, left my bike in the Peruvian hostel, and got myself a bus ticket to Ecuador. After a stopover at the Chan Chan Ruins and Temples Huacas de la Sol y de la Luna in Trujillo I crossed the border to Ecuador.